The inviting town of Sa Pobla is centrally located towards the north of Mallorca. Situated inland slightly away from the coast, the town lays adjacent to many of the islands natural attractions and inviting rural villages. With a resident population currently standing at just over 12,000 Sa Pobla is considerably larger then many of the rural villages that we have reviewed across Mallorca. However, many comparisons still remain with its smaller counterparts, most notably the thriving local community that is supported here and you are sure to be impressed at the warmth and hospitality that is all to typical of rural Mallorca. The village is linked in well with the islands transport network, and can be reached easily both by car and rail. It seems somewhat surprising to suggest that for once, a centre of civilisation that remains relatively untouched by tourist operators can be reached by anything but a motor car, but such is the case here. Indeed, the town acts as the termination of the Mallorca rail network, of which the capital city of Palma acts as the focal point. For complete convenience however, we recommend the private hire of a car as this can be of further use throughout your stay here. Transferring to Sa Pobla from the main airport of Mallorca is a simple and straightforward exercise. Upon leaving the airport, you will need to take the Ma-15 towards Palma. Rather then heading into the city however, you will need to head for the Ma-20 which arcs around it. From here, you will then need to get onto the Ma-13 which will take you past Inca, the islands second city. You will need to keep on this road until you see signs for the Ma-3421. This road will take you directly into Sa Pobla. Sa Pobla makes an ideal base for your holiday on the island, not least for the range of attractions that are offered here and of course, further a field. 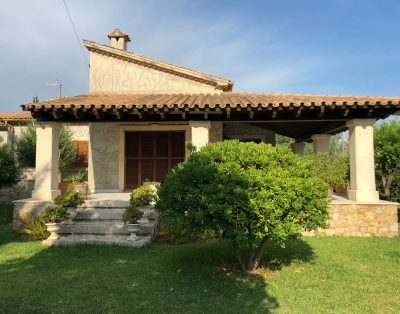 For those that are holidaying with a family and small children, the beautiful beaches of Can Picafort and Alcudia are both less then 10 km away, whilst the tranquil nature reserve ‘S’Albufera de Mallorca can be found almost adjacent to the town. Catering for visitors of all tastes, this area of outstanding natural beauty enables the tourist to immerse themselves in Mallorcas rich natural heritage, or to just simply enjoy the scenery in a relaxed and quiet atmosphere. The theme of peace and relaxation appears to be right at the very heart of this attractive town. The small quaint streets contain local authentic shops all selling a wide range of locally produced craft, whilst the delightful old quarter forms the heart of this town. Housing a number of traditional Mallorcan restaurants, these form the perfect place to spend a short time taking in scenic surroundings of the town amidst the gentle pace of life here. And should you wish to further pursue the cultural theme on offer then why not take a leisurely walk around the Local Museum and the Parish Church. These give the visitor a good insight into the historical workings of the town and will help you to understand how the Sa Pobla of today came about. Sa Pobla is an interesting town and without doubt provides the ideal place for a holiday on Mallorca. Its wide range of sights, both in the town itself and within the local vicinity provide firm sources of entertainment for visitors of all ages and interests. These take many different forms, from the beautiful scenery of the surrounding countryside, to the pleasant beaches to the north and even to the slow paced ways of life that are so very evident in the town. It is fair to say that Sa Pobla is a captivating place, one in which you are sure to enjoy a relaxing but fulfilling experience whilst here in Mallorca.